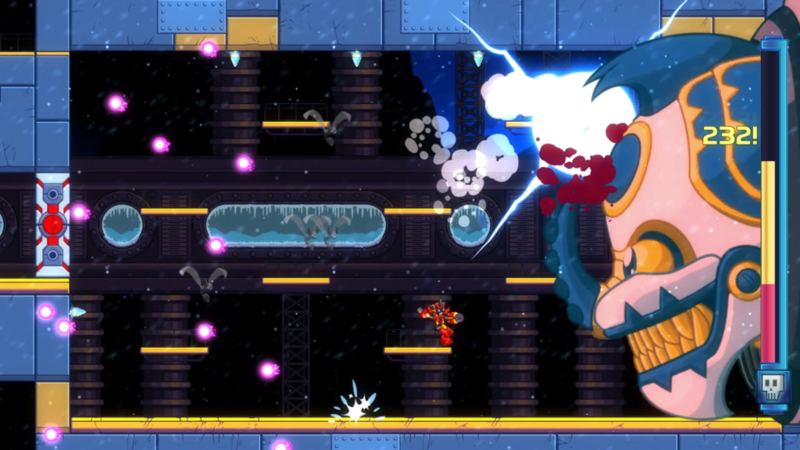 20XX, the roguelike action platformer from Batterystaple Games and Fire Hose Games, wall jumps to Nintendo Switch and PlayStation 4 on July 10, 2018 followed by Xbox One on July 11, 2018. Inspired by classic Mega Man titles, but with modern twists, 20XX remixes retro design with roguelike elements to create an exciting “one more play” experience built around skill growth. In 20XX, players will dash, jump, and blast their way through procedurally-built stages made to test their grasp on controls and situational awareness rather than memorization or trial and error. This structure ensures every session plays out differently than the last and, along with multiple difficulty settings, daily ranked challenges, and co-operative multiplayer (both online and local), provides a near-endless amount content for players to experience and enjoy while jamming out to the heart-warming tunes of 20XX’s pulsing chiptune-inspired soundtrack. Available now via Steam, where it has sold more than 100,000 units, 20XX was named one of Valve’s Top Early Access Graduates in 2017. The console release of 20XX will be bundled with the “Hawk DLC Pack,” which features a third playable character with a distinct whip-like attack that allows her to steal energy from enemies and power-up five unique special abilities. To learn more, visit 20XX’s website, follow the team on Twitter, and like the game on Facebook.